The fleece vest's in Silicon Valley are throwing confetti, drinking Fed wine and congratulating each other with their Apple wrist phones. The Nasdaq 100 Index prints a new all-time high at 7715.07 and new all-time closing high at 7680.72 (green lines) taking out the prior all-time high at 7700.56 from 10/1/18 and prior all-time closing high at 7660.18 from 8/29/18. The Nazzy 100 record highs follow the new all-time highs in semiconductors. The SOX and NDX are parabolic comically trading like commodities. You know what happens to parabolic charts. The global central bankers have destroyed all price discovery and business cycles with their obscene Keynesian money printing. The chips and tech stocks are the main drivers of the Q1, now into Q2, stock market rally. The ADX is up at 40 in the stratosphere confirming the strong trend higher in major tech stocks (think FAANG). The market bears will need the ADX to roll over. The Aroon is historic. It is nice to lock the chart into history displaying the perfect +100 and zero Aroon readings. The price action is historic. The trading volume jumps higher. Perhaps that is Joe Retail running into the big tech stocks ready to hold the bag; every top needs a sucka. The upper band was violated so the middle band at 7505, and rising, is on the table, as well as the lower band at 7270. The collapses from rising wedges can be quite dramatic. The RSI, stochastics are overbot agreeable to a pullback. The chart indicators are in negative divergence wanting to see price retreat lower. That gap at 7400 is big enough to drive a truck through. There are other gaps below. Despite the four-month rally, the 150-day MA line remains dead flat. Isn't that something? That pink line went negative in December and the Nasdaq 100 major tech and high-flying stocks remain in a cyclical bear market pattern ever since. That is amazing as price prints an all-time high. These are not your grandfather's markets. The death cross (black circle) occurs in December and remains in play. The bears will need to drive the NDX down to 7K and get it to trend lower from there to maintain the death cross, otherwise, a golden cross will be likely out in May/June. It will be interesting to see if the likely imminent neggie d spankdown and rising wedge collapse can send price down to there quickly. The ongoing uber low CPC and CPCE put/call ratios continue signaling rampant complacency and fearlessness that needs to correct with a beating. The Mueller report is going to be released in the hours ahead which may cause wild swings either way. The charts want to pull back but President Trump keeps hyping the US-China trade deal and Chairman Powell remains in the basement of the Eccles Building printing money like a madman. This information is for educational and entertainment purposes only. Do not invest based on anything you read or view here. Consult your financial advisor before making any investment decision. Note Added Good Friday, 4/19/19: US markets are closed today. In the Thursday session, the NDX does not print a new all-time high, so the record high at 7715.07 from 4/17/19 remains in place. The Nazzy 100 does print a new all-time closing high at 7689.72 on 4/18/19 interestingly, exactly 9 bucks above the record closing high from the prior day. 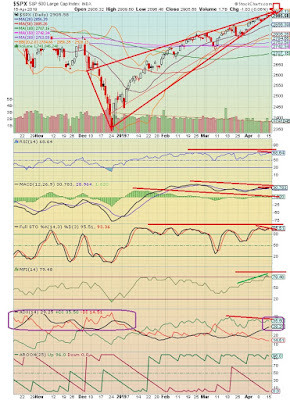 The NDX daily chart remains in full negative divergence across all indicators. The SOX (semi's) prints a new all-time record high at 1576.79 on 4/17/19 and a new all-time closing high at 1558.13 on 4/18/19. SMH and XSD are also at record highs. None of the FAANG stocks (FB, AAPL, AMZN, NFLX, GOOGL) are at all-time record highs. Alphabet (Google) is the closest. Any sogginess in stock trading on Thursday due to the release of the Mueller report was nullified by the pre-holiday and full moon bullishness. Perhaps stocks will finally start to come back down to earth on Monday which is Earth Day. The SPX daily chart continues wanting to top out but the happy news messages keep tweaking prices ever higher. Treasury Secretary Mnuchin's comments on an agreement on enforcement methodology for a US-China trade deal creates another push higher. Ditto the Fed's Evans, a dove, who says an interest rate cut is on the table ahead if inflation remains subdued. The central bankers are the market. Boooiiinnng. Equities receive more love on the happy talk. The chart indicators remain in negative divergence except for the money flow. With a US-China trade deal imminent and the central bankers promising ongoing easy money, the money flow pops higher. This juice creates a couple more days of upside joy. The expectation is for price to drop one day, due to the neggie d on the other chart indicators (Monday), but then recover for a day to another new price high (today; Tuesday), and at that price high, as long as the money flow does not print another higher high, the top is in again on the daily basis with universal neggie d.
S&P futures are up +9 about five hours before the opening bell for the regular trading session on Tuesday morning. If this happiness remains, the SPX will print another new high at 2911-2916. Simply check the money flow (and other indicators) to see if they are all in neggie d, if so, the top is in again. Stocks will drop unless President Trump, or his henchmen Mnuchin and Kudlow, or the central banks, speak more happy talk. If so, that will squeeze out another couple days of upside. The upper band at 2928 must be respected, say if a trade deal is announced, but price has already tagged the upper band so the middle band at 2856 is in play and more likely. The lower band at 2805 is also in play going forward. Keystone's 80/20 Rule says 8's lead to 2's so price overtaking 2880 opened the door to 2920. If price tags 2918, that opens the door to 2922. The 2908 level opens the door to 2912. Remember that the rule works in reverse as well and 2's typically lead to 8's. 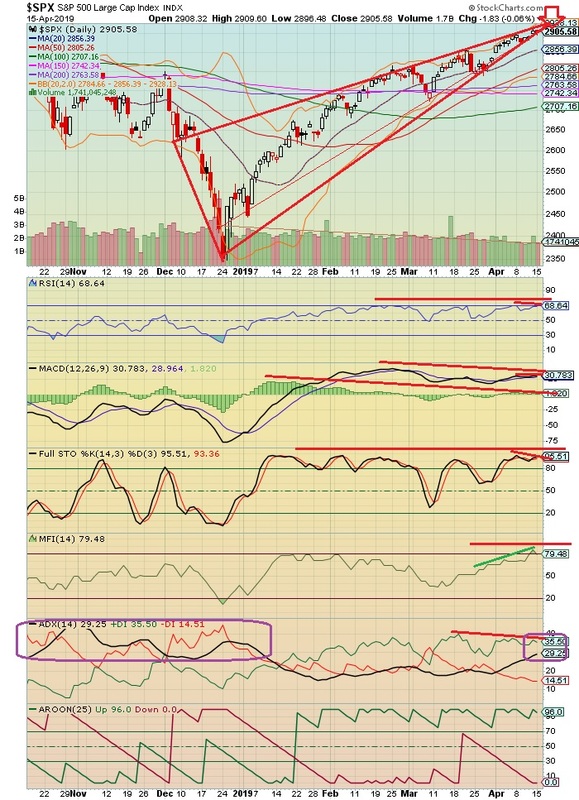 The red rising wedge pattern is ominous since the collapses from rising wedges can be quite dramatic. The low put/call ratios continue to want to bite off a big chunk of bull flesh. The red lines show indicators all in neggie d sans the money flow as discussed above. The purple box for the ADX shows the strong downtrend in Q4 at the end of last year but this long 3-1/2 month uptrend has not been a strong trend, until now. This is very odd market behavior. The bulls will be happy if the ADX continues higher since it will show that the rally has new legs and will extend a while. Bears need the ADX to simply roll back over lower or flatten. The Aroon green line remains pegged at the maximum ceiling while the red line is at the maximum floor at zero. It does not get any more euphorically bullish than that. The SPX daily chart will likely top out today on the new price high and want to sell off but the weekly chart still has upside juice available on the weekly basis. So, the stock market will either take a big drop right now (due to uber low put/calls signaling rampant complacency) but then recover in a couple weeks back to new highs again and then print a top later this month or early in May that leads to a multi-week decline, or, stocks will chop with only minor pullbacks for 2 or 3 weeks as the weekly chart tops out, and the big drop and significant multi-week decline begins and occurs in May and June. This information is for educational and entertainment purposes only. Do not invest based on anything you read or view here. Consult your financial advisor before making any investment decision. Note Added Good Friday, 4/19/19: US markets are closed today. The SPX is sitting at 2905 up 13 of the last 17 weeks a phenomenal run. The NDX, SOX, SMH and XSD are all at record highs so obviously tech and chips are the main driver of the stock market this year. None of the FAANG stocks (FB, AAPL, AMZN, NFLX, GOOGL) are at all-time record highs. Alphabet (Google) is the closest. Any sogginess in stock trading on Thursday due to the release of the Mueller report was nullified by the pre-holiday and full moon bullishness. Perhaps stocks will finally start to come back down to earth on Monday which is Earth Day. The SPX daily chart should continue to experience a slap down due to the neggie d. The SPX weekly chart is neggie d across all indicators except for the MACD line. This hints at a jog move ahead to likely create the multi-week top. Stocks may retreat next week to satisfy the daily chart but price will come back up due to the long and strong MACD line on the weekly chart, thus, down one week, but the following week, say the week of 4/29 to end the month, May 1 is a Wednesday and FOMC decision day, stocks should recover to top-tick the weekly chart. The S&P 500 weekly chart will likely top out with neggie d at the end of this month or early May and that will lead to a multi-week decline. Perhaps the low put/calls are simply waiting now for the SPX weekly to top out and this extreme euphoria and complacency will send equities down the rabbit hole along with the neggie d.
INDU or DJI Dow Jones Industrials Index Weekly Chart; President Trump Proclaims that the Dow Should Be 10,000 Points Higher Above 36,000! "If the Fed had done its job properly, which it has not, the Stock Market would have been up 5000 to 10,000 additional points, and GDP would have been well over 4% instead of 3%...with almost no inflation. Quantitative tightening was a killer, should have done the exact opposite!" The president references the Dow since this is the most-followed index by the public. The message is clearly directed at the broadest audience possible (think election). Trump will blame Powell if the stock market drops like a rock. That is the function of the president's ongoing harassment of the Fed head. If stocks tank, especially into the election, Trump will say he was the guy that fixed everything but Powell ruined it. If the Dow collapses 10K points in a major selloff and couple-year malaise, Trump will say he told everyone it would happen because the Fed made a mistake. Trump is creating a back-door exit plan. This is how the crony capitalism game is played in America. President Trump loves easy money; he is a big proponent of goosing markets with easy money. Despite promises to lower the US debt, the debt blew through $23 trillion and running quickly higher. No one cares. The rich are too busy shoving money into their pockets. The Administration cut banking regulations and taxes that benefited the wealthy class. This was Trump's priority when he came to power since they are the ones that financially support his re-election campaign. Such is America's crony capitalism system. It is not rocket science. Comically, Trumpster could have kept Janet Yellen, Queen of the Doves, at the helm at the Federal Reserve, and he would have had all the dovishness and easy money he wants. Trump decided to ax Yellen and go with Powell. He says he picks the best people. It was his decision. The chart would show the range of 31.4K to 36.4K (+19% to +38% higher) that Trump says the Dow should be at right now but, humorously, the Trump targets are literally, off-the-chart. The ongoing triple-top pattern is interesting. As Keystone says, "If ands and buts were candy and nuts, everyday would be Christmas." This information is for educational and entertainment purposes only. Do not invest based on anything you read or view here. Consult your financial advisor before making any investment decision. 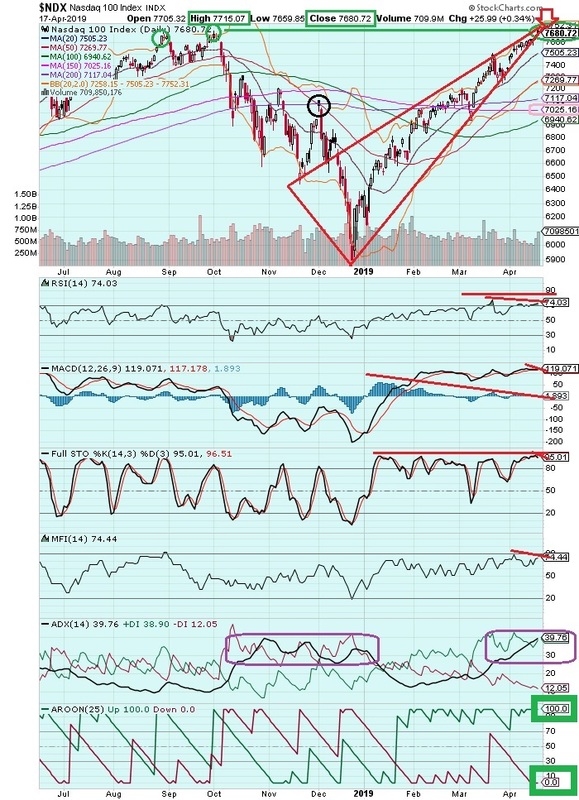 SPX (S&P 500) support, resistance (S/R), moving averages and other important levels are provided for trading the week of 4/15/19. The US stock market is closed on Good Friday this week with Easter Day on Sunday. Passover begins Saturday and ends the following Saturday. Levels shown in bold are strong resistance and support. Bold and underlined levels are very strong and important S/R. The all-time record high print for the S&P 500 is 2940.91 on 9/24/18 (seven months ago) and the all-time closing high is 2930.75 on 9/20/18. The SPX all-time record intraday low is 666.79 (the infamous 666) on 3/6/09 (one decade ago) and all-time closing low is 676.53 on 3/9/09. For 2019, the intraday high is 2910.54 on 4/12/19 (last Friday) and closing high thus far this year is 2907.41 on 4/12/19. For 2019, the intraday low is 2443.96 on 1/3/19 and the closing low for this year thus far is at 2447.89 on 1/3/19. The Federal Reserve, PBOC (China’s central bank), ECB and BOJ colluded to save the stock market in early January and succeeded into the present. The central bankers are the market. The SPX prints the high for this year last Friday at 2911 only 30 points away from the all-time high at 2941. The week begins at 2907. Note how price was held in check on Friday by the overhead resistance at 2912 and very strong resistance at 2914. If the bulls can punch through 2912-2917, they will pop the S&P 500 to 2924-2926 which would set up for a test of the all-time closing high at 2931. For the bears, the SPX needs to drop through that support cluster at 2898-2906. If so, the S&P 500 will drop to the uber strong and very significant support level at 2887-2888. If this fails, price then drops lower to test the 2867-2873 support. Generally-speaking, the bulls maintain an upper hand in the stock market as long as the 200 EMA on the 60-minute at 2837 holds. If 2837 fails, the stock market will begin collapsing in earnest. The stock market could go into free fall if the 12-month MA at 2772 fails. The SPX is above the 12-month MA at 2772 so the stock market is in a cyclical (weeks and months) bull market pattern. The NYA is above its 40-week MA so the stock market is in a cyclical bull market pattern. The 150-day MA at 2742 remains dead flat and in negatively sloping since Q4 last year so the stock market is in a cyclical bear market. These indicators will line out in the same direction and will 100% confirm the path ahead for the stock market. Bulls need the 150-day MA to start sloping upwards and they will be singing happy songs. Bears need the SPX to drop like a rock and lose the 2772 level to usher in market carnage. The strongest support/resistance for the SPX (S&P 500) is 2941, 2931, 2914, 2901-2904, 2888-2889, 2873, 2867, 2862, 2854-2857, 2846, 2831-2835, 2822, 2806-2813, 2798, 2786, 2776-2780, 2743-2744, 2733-2738, 2723-2728, 2713, 2691, 2670, 2659, 2650-2652, 2628, 2584-2588, 2578-2581, 2560, 2548, 2529-2532, 2503, 2484-2497, 2478-2481. The full moon peaks for the month on Good Friday. Stocks are typically bullish moving through the full moon each month. Stocks are typically bullish the two days before a three-day holiday weekend so there may be buoyancy in equities on Wednesday and Thursday this week. This hints that if the bears want to growl they had better start out of the gate Monday and early in the week. Global earthquake activity will likely increase going into next weekend and early in the week of 4/22/19 since the Earth and Moon will be at a gravitational inflection point. The uber low CPC and CPCE put/calls remain in play signaling rampant market complacency wanting to see a big pullback in the SPX of 40 to 150 handles, or more, starting at any time forward. The SPX weekly chart is slowly topping out. The stochastics are overbot and negatively diverged. Ditto the money flow. The RSI and MACD lines continue to eek out upside juice so this hints at sideways jog behavior for 2 to 4 weeks as the S&P 500 tops out in this weekly time frame. The SPX may move down this week, then up the next for a new high, then down for a week, then up for the following week eking out another slightly higher high. 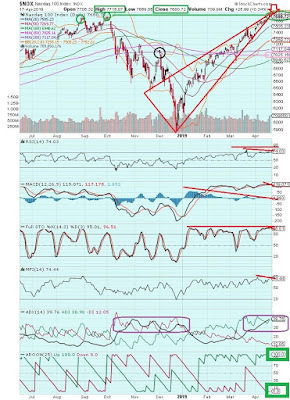 At that time, the indicators will likely be in negative divergence and the top will be in on the weekly basis say, late this month or the first half of May. That top will lead to many weeks of downside for stocks so the “Sell in May and Go Away” adage may hold water this year. So the SPX weekly chart is not quite ready to give up the ghost but the low put/call ratios have been champing at the bit to send stocks sharply lower. What will give? Perhaps one of two scenarios will play out. First, the SPX may drop like a rock right now and flush quickly to 2837 then recover just as fast with another V bottom and then top out as described above in the late April-early May time frame and drop for many weeks forward after that. Second, sideways choppiness may be the order of the day for the remainder of April. A slight pullback in the SPX this week will then lead to a slightly higher high the following week, then a slightly weaker week, you get the picture, smaller moves, and this continues for 2 to 4 weeks to allow the weekly chart to top out with neggie d. Then all Hades breaks loose with stocks falling like rocks, the low put/calls then take their vengeance, and equities sink lower for many weeks forward (likely at least a couple hundred points lower for the SPX). The Housing Starts data release on Friday is key. If a US-China trade deal is announced, markets may bounce a day or two but it has the feel of a sell-the-news event. The Trump administration has hyped the trade talks for four months and the SPX pops a half-dozen points on each soundbite. There is a lot priced-in. Interestingly, the central bankers have all shown their cards this year already. The global central bankers including the Fed, PBOC, ECB and BOJ colluded in early January to save the world’s stock markets. They saw the writing on the wall on 1/3/19 when the US market was falling apart and they panicked. The central bankers are one-trick Keynesian ponies that only know how to print money that enriches the wealthy elite class. For the last decade, the Fed and other central bankers have enriched the privileged class beyond their wildest expectations while common people suffer through high-debt and structural unemployment. The coming recession will likely trigger a class war in the United States. Global populism and socialism are on the rise. Human greed and corruption destroyed capitalism. America is best described as a ‘faux free market crony capitalism financial system’. It is what it is. Note: If the list below displays any blank spaces, view it in the Google Chrome browser or disable your Adblock software. Doing this allows the KE Stone blog sites to receive proper advertising credit from Google and Amazon. Support the blogs if you want the information to continue. Humorously, waiting for the top in equities is like waiting for Godot. It'll be here any minute. The euphoric stock market bullish joy continues. Floor traders break out in song with an enthusiastic gospel rendition of "Oh Happy Day" as they buy stocks at the ask. The bullish happiness turns into a buying frenzy on Friday afternoon. Investors are worried about missing the train leaving the station so they are buying any stock with a heartbeat with reckless abandon. The SPX ends Friday at 2907 with a HOD at 2911 only 30 points from the all-time record high at 2941. The SPX receives a spankdown as the hourly and daily charts show, however, the central bank largess and US-China trade hype continue to support and elevate equities. After price started to relax lower due to the negative divergence of the chart indicators, Treasury Secretary Mnuchin runs to a microphone and proclaims that the US and China have reached agreement on an enforcement mechanism for the new trade deal. Wow. That is big news since the expectation would be that the negotiations may continue for a couple years before the enforcement methodology was hashed out. The Chinese leaders are filthy communists that have lied and not honored their prior pledges to America for the last three decades. The United States made China the super power it is today. The greedy American politicians and wealthy class shipped middle-class jobs and technology overseas so their huge stock portfolios could grow obscenely larger and lead into the present day generational and family wealth that the top 5% enjoy. America's wealthy elite class sold their fellow citizens out over the last five decades. The Chinese got away with things because the greedy American wealthy were busy stuffing money into their own pockets. Such is life. Humans are greedy animals. Thus, China has zero credibility when it comes to any trade pact. This is why the enforcement mechanism is so critical. For Mnuchin to claim that an agreement has been reached is a big deal. For his sake, he better not have been blowing smoke up everyone's arse. Stocks leap higher on that news during the week which basically means that a US-China trade deal will occur. Then China export data was very strong so analysts proclaim the global economy is going like gangbusters and all is great ahead. Copper leaps higher since global growth appears to be getting goosed by the PBOC's money printing. Always remember, the central bankers are the market. China lending data jumps strongly higher. The communist nation's money supply is also growing. That is a green light for stocks since the liquidity has to flow somewhere and stocks are pumped higher to reward the wealthy class. It's a great game; if you are wealthy of course. The stronger Chinese lending data creates a pop in global stocks. JPM beat on earnings and jumps nearly +5% on Friday. The Q1 bank earnings season begins with a joyous party. The banksters sip BOJ brandy and Fed wine. They smoke tasty Cuban cigars dabbing the smelly ashes onto the heads of the stupid huddled masses. XLF gains +2% last week. The jump in banks and copper, the two parameters that Keybot the Quant has been highlighting, ran higher so the bull party continues. Traders are ignoring any disappointing news and only touting the happy stuff to keep the joyous euphoric party going. Consumer Sentiment is 96.9 missing estimates but still a healthy number. The drop in sentiment correlates to gasoline prices. Americans are starting to complain that gasoline at the pump is now above $3 per gallon again. Higher gasoline prices typically dampens retail spending. No worries. There's President Draghi from the ECB pouring more monetary policy booze into the global punchbowl. The Fed, ECB, BOJ and PBOC form a congo line and begin singing Bobby McFerrin's "Don't Worry Be Happy." The CPC drops to an 8-month low. So traders were very uber complacent and fearless about buying stocks last week and now they are very, very, very uber and euphorically complacent and fearless about buying equities. No one believes stocks will ever go down since the central bankers are printing money like madmen. Easy-peazy. However, you know what happens when all traders are on one side of the boat. Yes, they are all wrong. The behavior of the put/calls remaining very complacent for long periods of time is not characteristic. This is ongoing epic and historic pricing action occurring in the stock market. The CPC drops to 0.74 the lowest reading since last summer when stocks were moving towards the Q4 waterfall crash. June, July and August last year saw complacency at these levels which resulted in 100, 50 and 45 point pullbacks, respectively. Interestingly, price is at the same level as the top last August. Last September the bulls managed a further rally but you can see that price was already flattening and becoming tired. For the last month, the SPX has moved through 2800-2907 about a 100-point range with the euphoric break-out higher occurring on Friday. A big pullback would have already been expected in stocks over the last month but as explained above, the central bankers, happy trade talk and perceived great economic data keep driving stocks to the stratosphere. The bottom line is to expect a big pullback at anytime, any hour, any day ahead. The downside should be from 40 to 150 points and since the markets have delayed a pullback for so long, perhaps there will be even more vengeance in store. Keybot the Quant remains long through all this market drama. Watch your wallet. The Sword of Damocles hangs over the market's head. This information is for educational and entertainment purposes only. Do not invest based on anything you read or view here. Consult your financial advisor before making any investment decision.